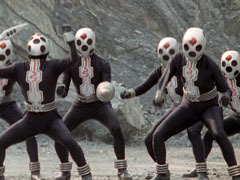 The Villains - Long Live the Power Rangers! Under the command of Emperor Gruumm, the Terror Spacecraft has traveled through outerspace in its journey to conquer and destroy planets. Earth is this battleship's current target. Emperor Gruumm is the leader of the Troobians, a planet-conquering alien force. He is evil, and destroys everything in his path. He destroyed Sirius, the home planet of Anubis, and now his next target is Earth. Gruumm seeks to get revenge against Anubis as well as conquer the Earth. However, it turns out that he is answering to a higher power that he refers to as the Magnificence. Don't let this ten year old's innocent look fool you. 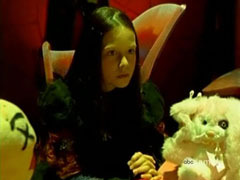 Mora is pure evil and can create real monsters with just her imagination. She has teamed up with Emperor Gruumm to take over the Earth. Morgana is Mora's adult form. Gruumm found Morgana and turned her into Mora until she continued to fail him. She is known for both her beauty and stregnth, but for some reason she still wishes to return to being Mora to recapture her childhood. Broodwing a very evil creature that sells weapons, creatures and robots to anyone who can afford it. He only cares about the money he makes and nothing about the destruction that follows. Broodwing takes pride in his merchant skills, and begins to plot revenge on Gruumm, when he starts ordering him to offer his services while refusing to pay. Krybots are robotic drones that serve as the Troobian grunt force. The Bluehead Krybot is a personal guard to Emperor Gruumm, and while more rare the the normal Krybots, they are smarter and more powerful. This Krybot usually has an army of normal Krybots at its disposal. The Orangehead Krybot is the rarest and most powerful Krybot. It has a powerful sword and attacks, the most powerful of which is the Triforce Shockwave. Often referred to as the Magnificence, Omni is a being that Gruumm answers to. Gruumm searches for a way to bring the Omni to Earth. He currently resides in a chamber onboard the Terror Spacecraft and has the ability to control anyone's mind. 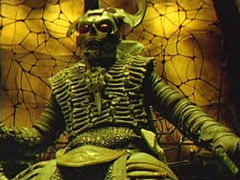 Gruumm has used all of his resources to prepare for the arrival of Omni on Earth by turning the Terror Spacecraft into his body which is created from stolen resources. With this newfound power, Omni is intent on ruling the galaxy. When the S.P.D. 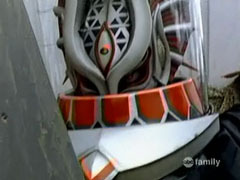 Rangers appear in the year 2004 to stop Emperor Gruumm, Zeltrax is recruited by Gruumm to battle the Dino Thunder and S.P.D. Rangers. He is defeated by the Black Ranger and the Shadow Ranger.